During the course of normal oven cooking, ovens and oven racks become dirty from grease and food particles. 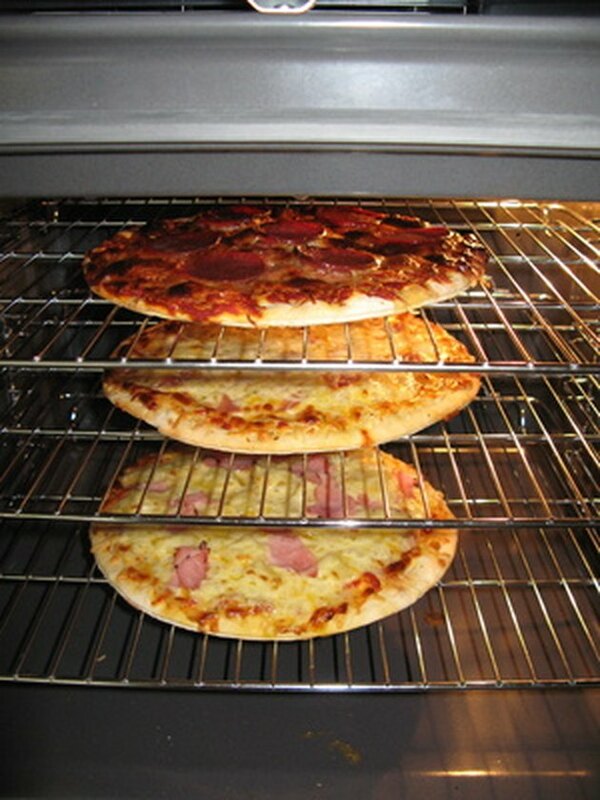 These grease and food particles can become baked onto the oven or racks, making them more difficult to remove. The racks and oven must be cleaned, or the built up residue can create a fire hazard. Ammonia is a chemical that can be used to remove grease and grime from ovens and oven racks. Ammonia is safe to use in an oven; however, it has a strong odor to it that is not pleasant, so use ammonia in well-ventilated areas. Food leaves residue and particles behind in an oven. Pour 1/2 cup ammonia in a small bowl. Place the bowl in the oven and let it sit overnight. The ammonia fumes help loosen built up grease, grime and food particles from the oven and oven racks. Open the oven and remove the bowl. Use damp paper towels or rags to wipe away residue from the oven and oven racks. Fill a sink with warm water and add a couple of squirts of liquid dish soap. Remove the oven racks from the oven by pulling them out. Submerge the oven racks as much as possible in the sink filled with dish soap. Use a sponge to clean the over racks with the soapy water. Rinse in cool water to remove soap residue. Allow the racks to air dry. Once dry, place them back in the oven. Wipe the inside of the oven with a soapy sponge or dish towel to remove any remaining grease and food residue. Wipe down with a damp cloth to remove soap residue. Are Corelle Dishes Oven Safe?